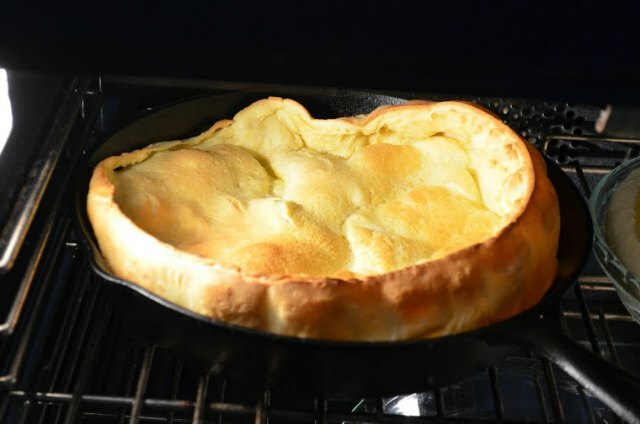 German Pancakes, Dutch Baby Pancakes or Puff Pancakes as they are frequently known in our house are simply delicious no matter what you call them. They are relatively easy to make and have an interesting texture. They don't have a leavening agent like traditional pancakes and the texture is definitely different. It's much more similar to a hybrid of a sweet popover and a little thicker then a crepe on the bottom. 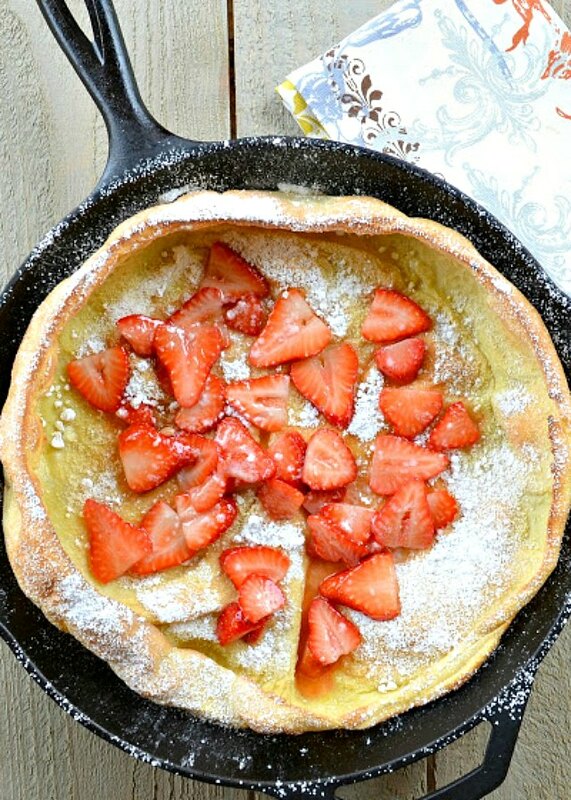 Dutch Baby Pancakes are super easy to make. They are usually reserved for the weekends around our house, but my Granny had whipped one up each morning before school for a whole year. They do require about 20-25 minutes in the oven which is the hardest part. We easily could eat these every day of the week and never tire of them. They can be made in a cast iron skillet but we also use pie plates regularly when we are making multiples. I can usually fit 2 German Pancakes in the oven at a time with pie plates. We like to dust our German Pancakes with a little powdered sugar and fill with a little fresh fruit. However you serve them and whatever you call them they will quickly become a breakfast favorite in your house too! To make German Pancakes preheat oven to 400 degrees and place 9-10" skillet or pie pan into oven to heat up. Break 3 whole Eggs, and scramble. Stir in 1/2 cup All-Purpose Flour and a pinch of Salt, until combined. Stir together eggs and flour, it will still have a few lumps. 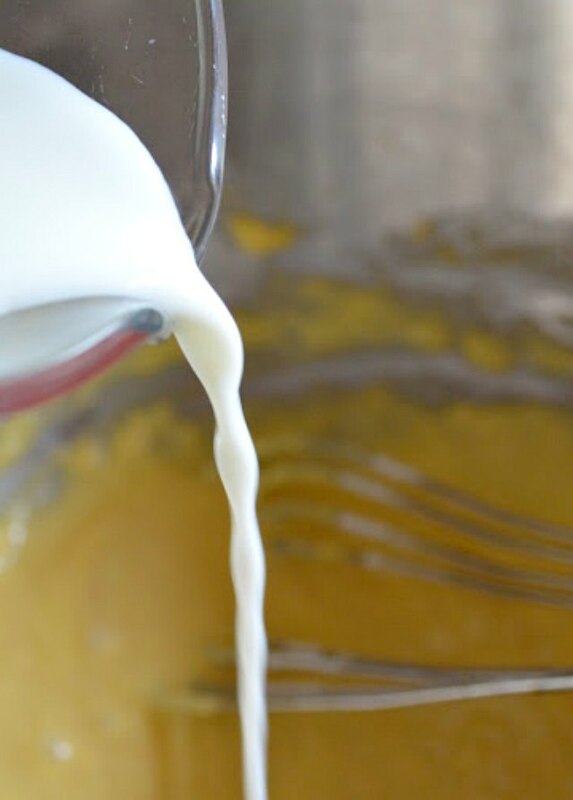 Slowly stir in 1/2 cup Milk, and 1 teaspoon Vanilla, until combined. It will now look like this and become fairly smooth. 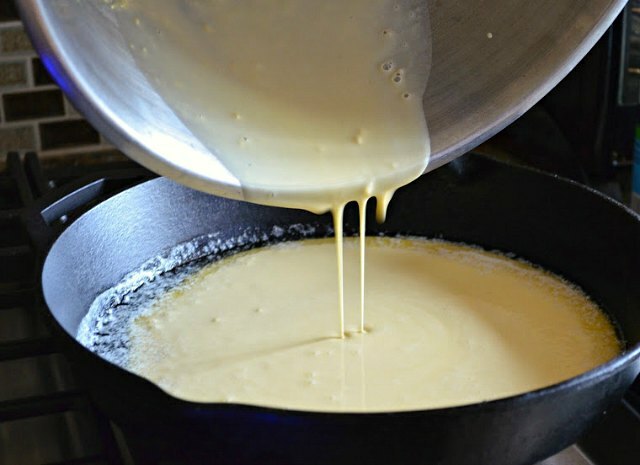 Melt 2 1/2 tablespoons Butter in the hot skillet or pie pan and swirl around to coat. 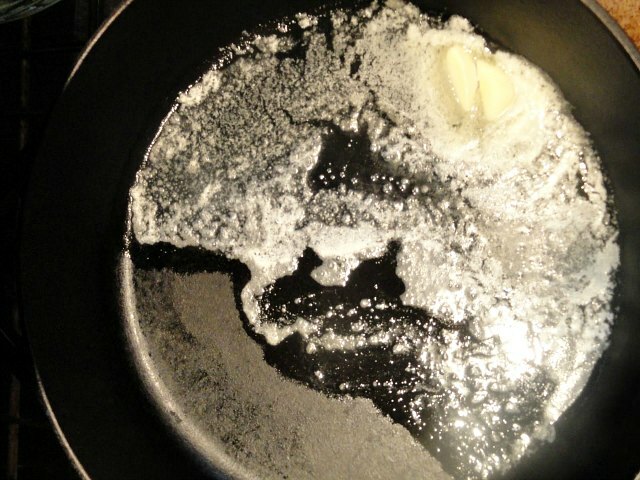 Add German Pancake Batter to hot melted butter in pan. Bake 20-25 minutes until puffed and golden brown. Add powdered sugar, fresh berries, or sautéed apples, and enjoy. Whether you call them German Pancakes, or Dutch Baby Pancakes, or Puffed Pancakes I know you'll love them as much as we do! 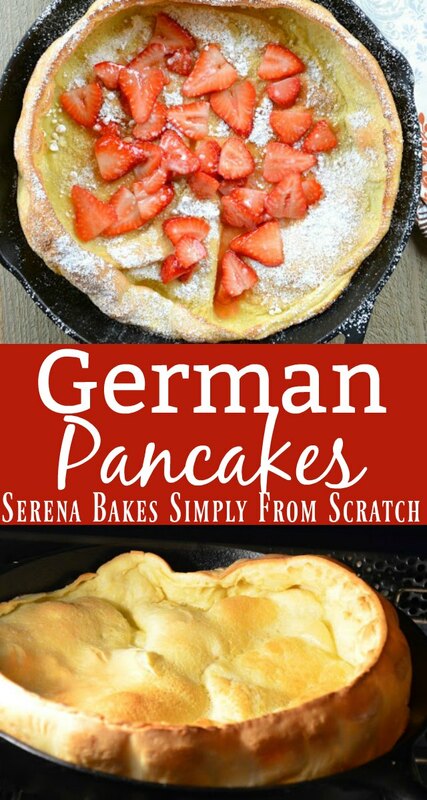 German Pancakes, Dutch Baby Pancakes, or Puff Pancakes recipe are easy to make for breakfast or brunch! They are delicious with a little powdered sugar or fresh fruit from Serena Bakes Simply From Scratch. Preheat oven to 400 degrees and place cast iron skillet or pie pan into oven to become hot. 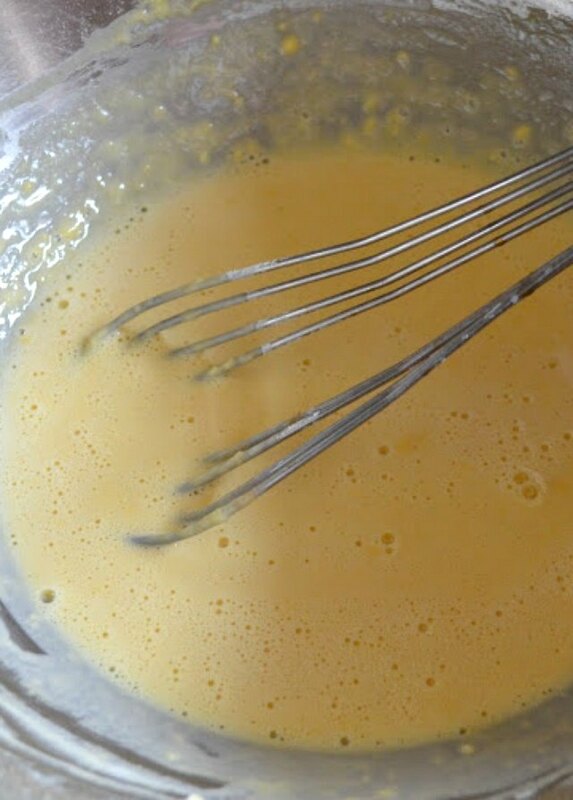 Add eggs to mixing bowl and whisk. 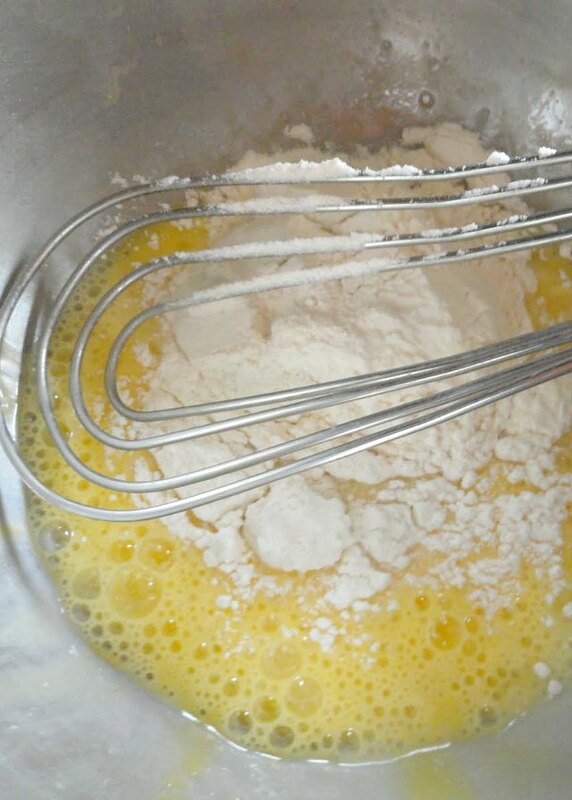 Add flour and a pinch of salt to the eggs. 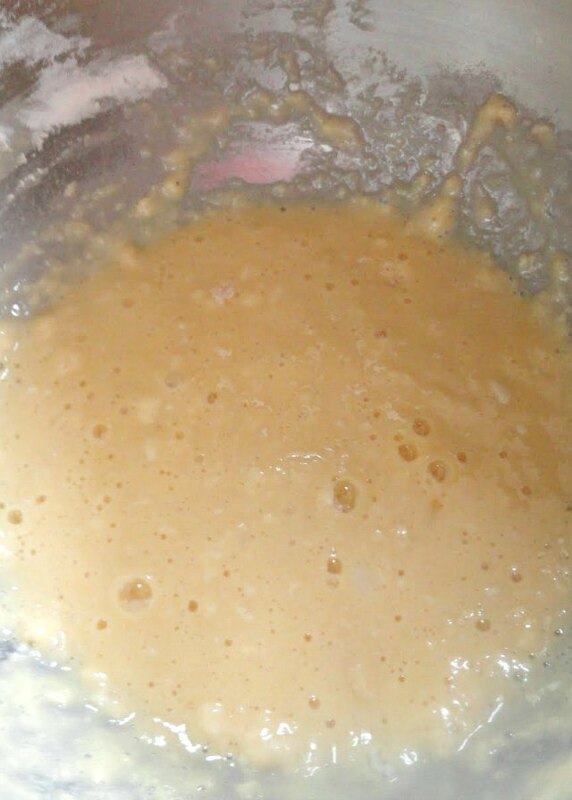 Mix well, mixture will still be lumpy do not worry. Place butter into hot skillet or pie pan and close oven door to melt. Once melted swirl pan around and add puff pancake mixture. Bake for 20- 25 minutes, until puffed and golden brown. Top with desired toppings. Calories are just for the pancake with no topping. Thanks for reposting I know this would be a huge hit for breakfast in our house too! Just the name 'puffy pancakes' makes me happy. I don't have kids but my 34 year old kid (husband) would love this. As would I! Thanks for sharing. This is something new to me! It looks so delicious I am saving this recipe. I am not surprised that it is already the pick in advance for special occasions by your family. Thanks for re-posting this one-yum! Seriously delicious recipe, Serena! The berry topping seems like a perfect addition. Happy Birthday to your Big Guy! Hugs! YUM. We call these German Pancakes or Dutch Babies and my whole family just devours them. My grandmother made them for us while we were growing up. Looks like something my daughters will enjoy! Would love to try this! fabulous!!! maybe even the college kids would get up for breakfast if this were on the menu!!! I am so hungry and these look so delicious! I love that name you gave this 'puffy pancake' Happy belated B-day to your son. Looks sooo delicious! I'm going to give them a try! I love these!!!! they are my favorite!!! Thanks for sharing! Wow, take out the vanilla and powdered sugar and this is a yorkshire pudding, to eat with roast beef! Add some salt and pepper to the mix and it's perfect. It's just the best thing for soaking up the gravy. This is gorgeous! What a delicious breakfast. I wouldn't share! Looks so yummy Serena! Wonderful pics!! I think my mom started to make these for my sisters when I went off to college...and she always topped them with sauteed apples! Apples or berries, I want these for my birthday breakfast, too! I wonder if whole wheat pastry flour would work for this. Yes whole wheat pastry flour does work just as well as all-purpose. What do these taste like compared to crepes or pancakes? Looks good but I've never heard of them. Nice blog BTW. Hmm.. The closest thing to these are popovers in taste and texture. They are thicker then crepes and really don't resemble the taste or texture of pancakes at all.. Thanks for this yummy Puff Pancake. It looks like Yorkshire Puddings that Kenneth Goh gave us the recipe in his blog. I will make it and top with stew pear with cinnamon and sugar. Can't wait to try it your way as he baked them in muffins tin. I haven't had a dutch baby in so long. I need to make one!